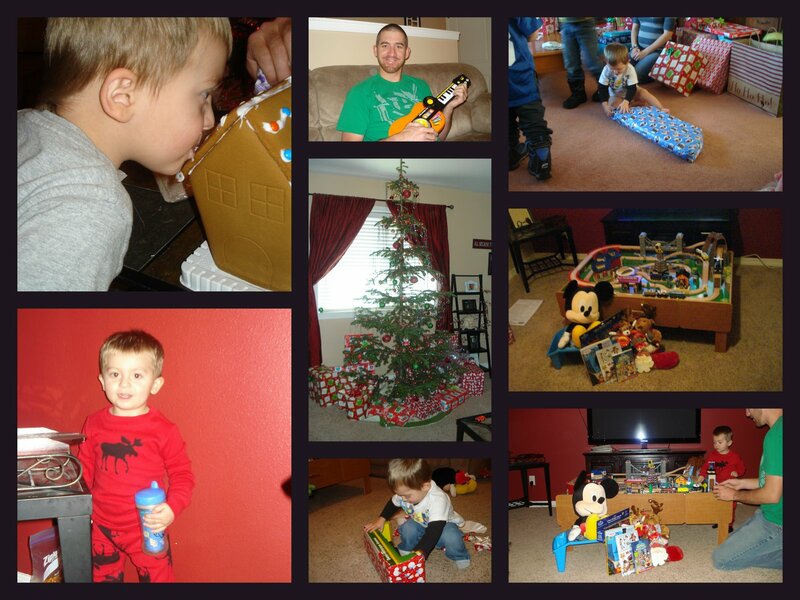 This Christmas had to be the best Christmas we have ever had!!! We stayed at our house this year and it was so nice to just be home with just us. Christmas Eve we made a ginger bread house and Tallon was eating it as fast as we could put it together. We woke up on Christmas morning and Santa came and sure spoiled Tallon . Tallon was more excited than anytime I have ever seen him , he got a train table which is great cause he loves ( or I could say is obsessed) with trains. Just seeing him so happy was one of the best parts of the whole thing. He also got his first bow!!! Now he can be just like his daddy even more. This year Brock and I decided to get a gift for each other together. We went and got ourselves a new TV! We love it and don't feel so outdated now. 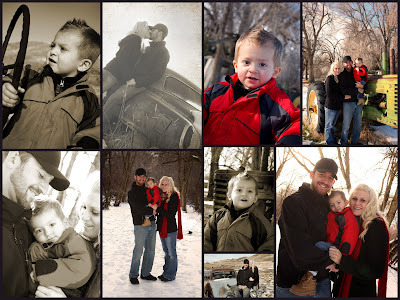 After we had our own little Christmas here at home we took the trek to Bear Lake to see our family's. We went to my families house on Christmas day and had our dinner and family time there. Then the day after Christmas Brock's family had there party and it was lots of fun being with family having good dinner and good company. Christmas was a blast this year and I can't wait for next Christmas to see what it brings!!! 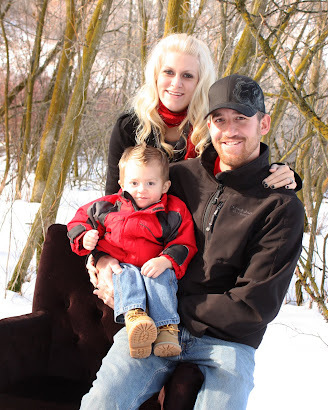 On Tallon's 2Nd Birthday I took a pregnancy test that was POSITIVE!!! We were going to have our 2Nd child!!! And We were so thrilled and excited and scared, all of the above.. So we decided to keep it a secret until Thanksgiving . At that time I was 10 weeks along. Anyways how we told everyone was we got Tallon a shirt that said "BIG BROTHER" on it. It took our parents forever to even notice, actually they never did notice the shirt. Everyone besides our parents noticed. At my parents house Brock had to say to my mom... Debbie do you like Tallons shirt??? And even after reading it for a second she almost didn't get it... Then the light bulb turned on!!! They were really excited and surprised! Then at Brock's parents house all the siblings noticed and we were even talking about it and the same thing his parents didn't really put 2 and 2 together ... we had to tell them to. They were all so excited too!!! 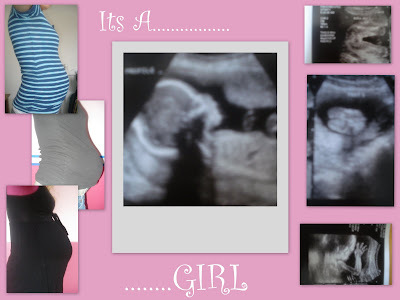 At around 2o weeks I had an ultrasound and we then found out that we were going to be having a little girl!! Oh boy was we excited!!! now we would have one of each, just perfect I think! I kept thinking for sure it was a boy , Brock and everyone at my work all thought it was a girl... I guess they were all right and I was wrong. That's ok with me though I always have loved girls and really always wanted one of my own...right after we discovered that my placenta was down covering my cervix and so they had me take things real easy for a month to make sure things would change so I did not have to have a c-section.. We had another ultrasound a month later and everything had moved out of the way, Well I am now 30 weeks along and everything is going good. I just cant believe how fast it is going. I am almost done , 10 more weeks till June 22 and wow is it exciting!!!! 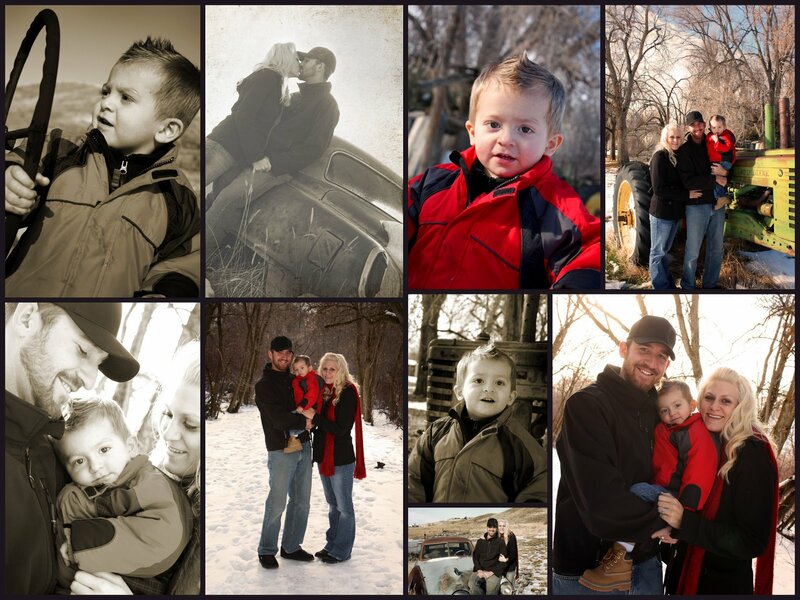 This December we had our family pictures taken by Rowsell Photography and I can tell you we haven't been happier with the results and the price was amazing!! Her name is Amanda Rowsell and she is just a fantastic photographer. We were very pleased and will definitely be using her again!!! 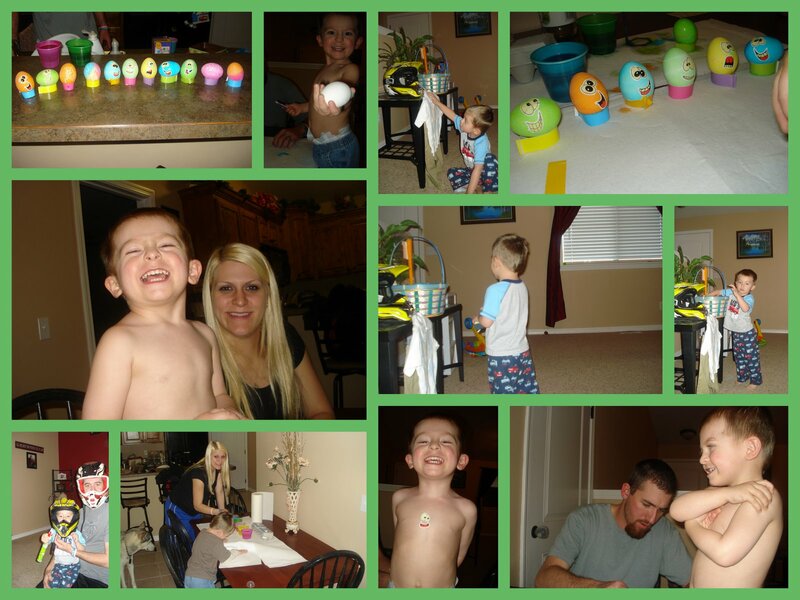 Easter This Year was pritty relaxed and fun! 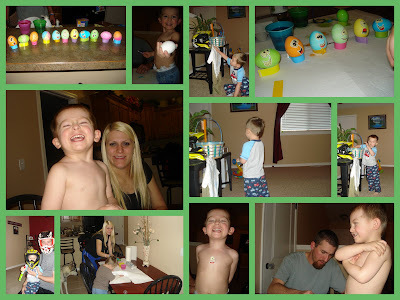 We died eggs the night before and Tallon really enjoyed it! Then Easter day we woke up and guess who came??? The Easter bunny came to see Tallon . He got him plenty of candy and a helmet to keep him safe on the four wheeler and bike... Tallon didnt want to put the helmet on untill dad did , but after that he didnt want to take it off. That afternoon Brock took Tallon for rides on the bikes , Tallon really enjoyed his day!! 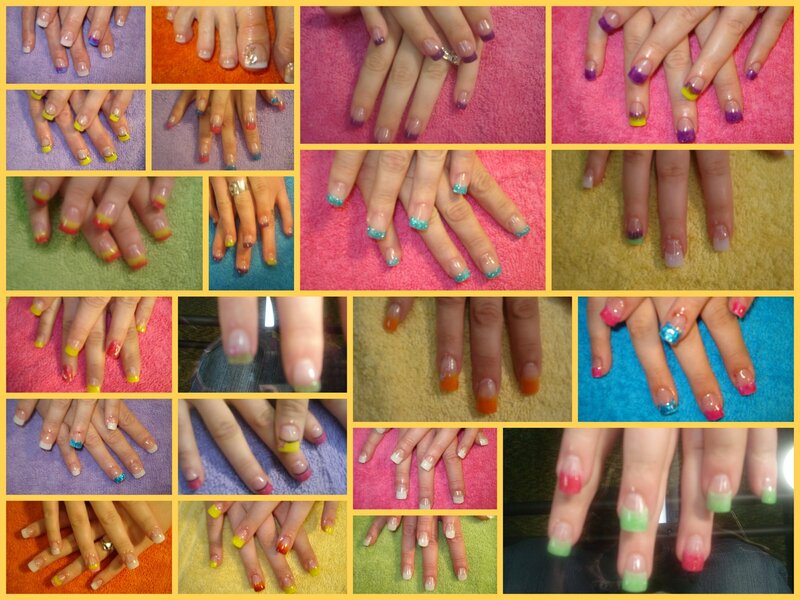 I have been going to Bear Lake one day a week to do nails down there! So far it is going pritty good, I have full clientell and I just love doing it! I work down at the Tanning Corner and It has just been working out pritty good! 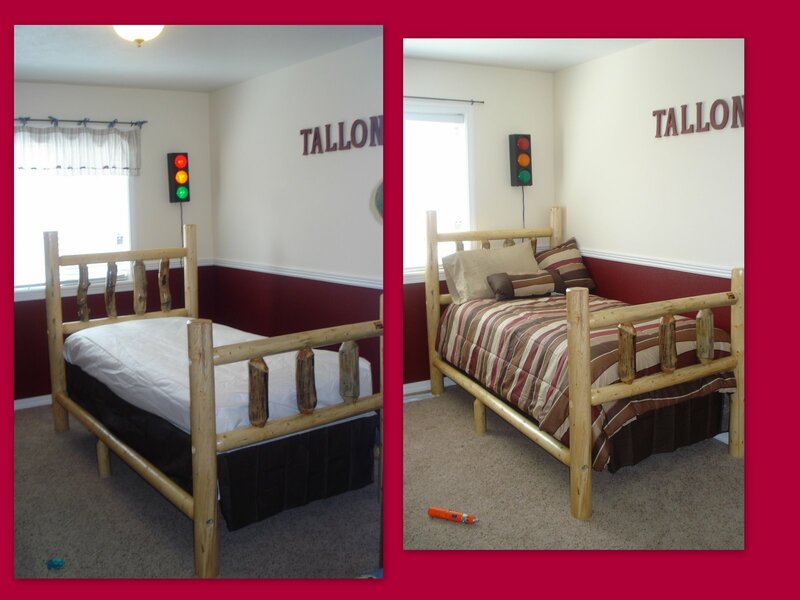 Tallon has a new bed!!! I cant believe how big he is getting ... it seems he was just a tiny baby. Now he is in his very own twin bed. We got the bed out of Logan at The Good Timber. It took six weeks for them to costom make it and it turned out Fantastic!! Tallon loves his new bed! 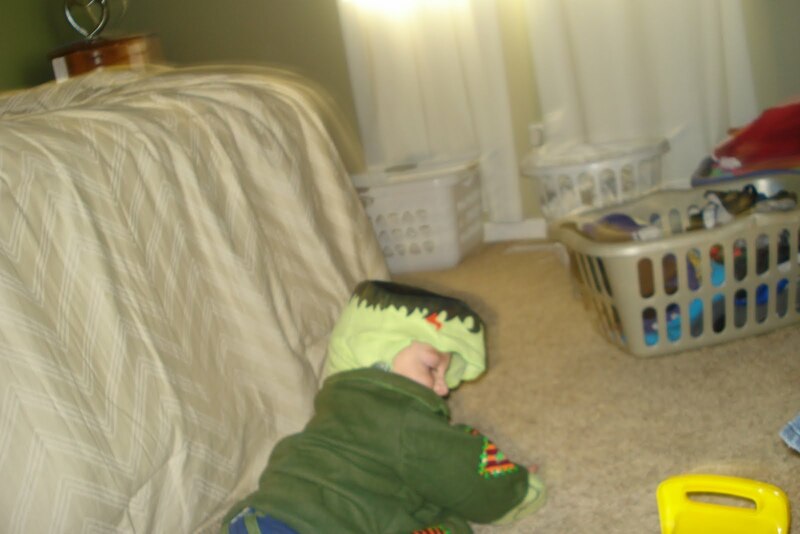 This year for Halloween Tallon wa suposed to be a cute little Frankenstien, BUT Tallon decided he wasnt going to be anything for Halloween cause he was a stinker. Tallon was himself for Halloween this year. This is the only picture I have of him in his costume. He was crying on the floor trying to take it off, thats why its not a good picture. But he had fun anyways. We went to Bear Lake to see family and trick or treat there! 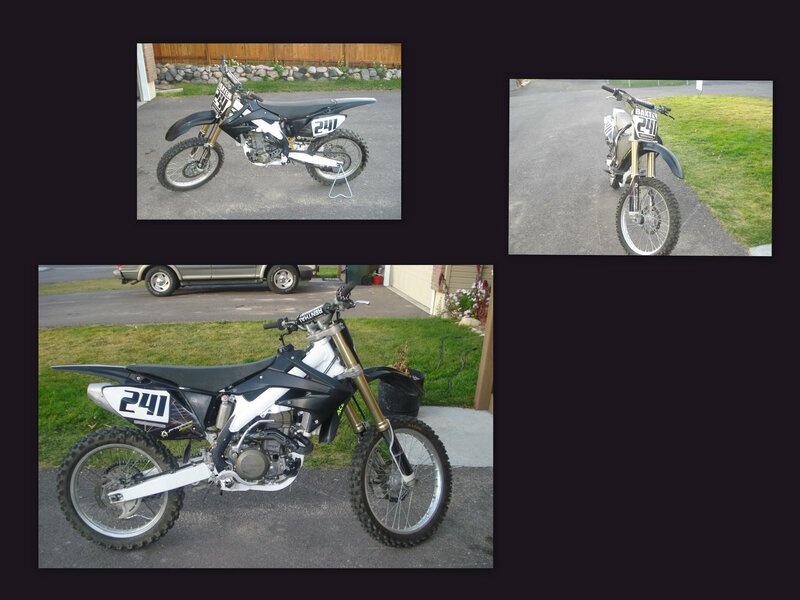 Well Brock decided to trade his snowmobile off on a new bike and He is pritty happy about the decition. I dont know if I should have let him cause he loves it a little too much!!! 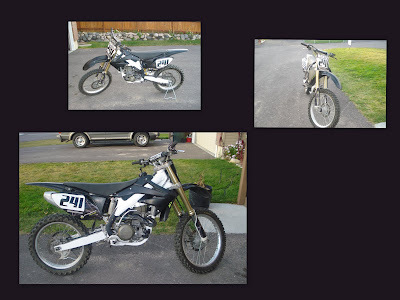 But if he is happy then we are and I like to ride bikes to so its a pluss for me! 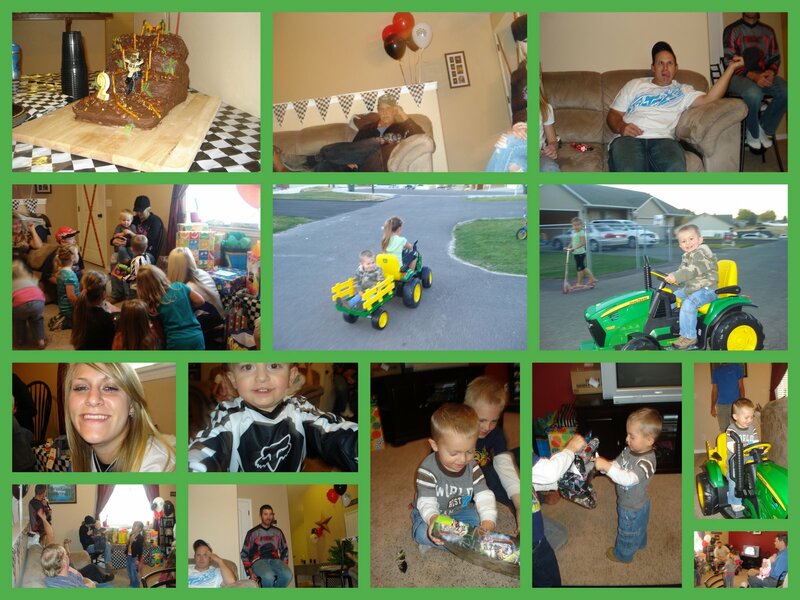 Tallon had his 2nd birthday party this year, I cant beleive how fast he is growing up! He is deffinitly not a little baby now. We got him a John Deer Powerwheels Tracktor and his is in love with it!!! Let me tell you this kid loves tracktors of all kinds! He is such a cutie, He had a lot of people show up for his party. Lots of great friends and family!! The same day Brock was also Ordained an elder in the LDS church by his Father and I am so proud of him for all he does for us and that is just one step closer we are in the right direction in life! I love my family and I want nothing but to be with them forever and ever!!! So a few weekends ago, Brock and Travis suprised Krysta and I on a date. We really had no idea were were was going for sure. But we first went to see the Elk farm in Preston. Its always cool to go there cause you can see the Elk up so close. Then we kept driving and we ended up going to Renagade Sports, They have a bunch of fun stuff you can do there. We rode go-carts and went miniture golfing. Then we went to dinner at the Beehive Grill , It was pritty good. They are famouse for there Root beer and it is pritty yummy! Oh and I cant forget there jalato ( Italian Ice cream) Its pritty good to! 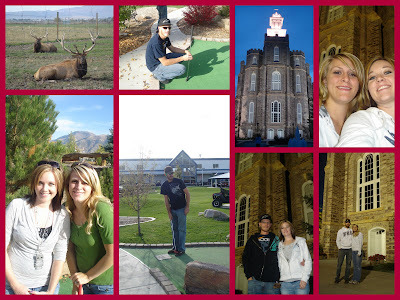 Then we went to logan temple grounds and walked around, I have never been there and I have probly been to logan a block away many times in my life! Its supper pritty. Then we went threw the Corn maze it is always fun to go threw, it wasnt quite as hard as the last time we went but it was fun!!! I loved going on our date it was a great suprize!! !